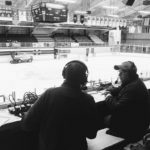 Marquette, MI – January 17, 2019 – The Marquette Redmen Varsity Hockey team won their ninth straight game with a 6-0 victory over the Escanaba Eskymos on Fox Sports Marquette 105.1-99.9. Once again the Redmen treated fans to a flurry of activity early in the game with two rapid-fire goals within the first few minutes of the opening period. The first came from Tanner Phillips, with assistance from Andrew Fedrizzi, and gave Marquette an early 1-0 lead over the Eskymos. It was a 1-2 punch from the Redmen as a goal from Lucas Guertin, assisted by Hogan Nemetz and Joseph Luke, brought the score to 2-0. The action died down considerably as the Redmen skated deeper into the first period. With no answering goals from Escanaba, however, Marquette’s lead followed them into the second. The evening’s excitement was not over yet as Redmen fans were treated to four goals and some spirited play from Marquette in an electric second period. A goal each from Gaetanno Cammarata, Tanner Phillips, Ryan Baldwin, and Thomas Dunleavy brought the score up to 6-0, dangerously close to a mercy end to the game for Escanaba. The Eskymos were not put out of their misery, however, as the third period came and went with no change to either side of the scoreboard. The Marquette Redmen Hockey team will take on the Kingsford Flivvers at home on Tuesday, January 22nd on Fox Sports Marquette 105.1-99.9. Pregame starts at 6:30 pm, the puck drops at 7:00 pm. 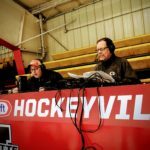 John and Joe are the voices of the Redmen Hockey games! 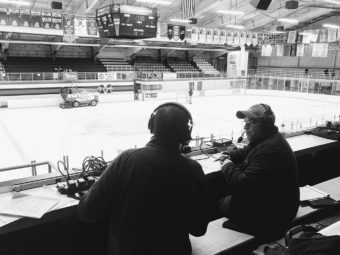 ← Previous Story The Marquette Redmen Hockey Team (1) Takes the Ice Against the Alpena Wildcats (0) in Bay Reps Showcase on FoxSportsMarquette 105.1 & 99.9FM and 103-FXD!